November 1924 was the start of a new era when the fellowship formally became a church. A Church meeting was held and the Rules were revised with affiliation to both the Baptist and Congregational Unions being written into the Constitution. The Committee of Oversight became the Diaconate and Church meetings were to be held quarterly instead of twice a year. Baptism, both infant and believers', was to be practised. The Church interested itself in both local and national life. Church meetings in the 1920s voted, amongst other things, to oppose a new betting tax, to oppose an application for an off-licence in Sycamore Road and to make a special collection for the Miners' Wives and Children's Fund. A yearly Flower and Egg Sunday was added to the Church calendar to be held near Easter as a springtime Harvest Festival. The flowers were given to local hospitals and the eggs sent to John Grooms' Cripple Homes. 1929 brought the 21st Sunday School Anniversary which was the start of an annual celebration with a prizegiving and outing. 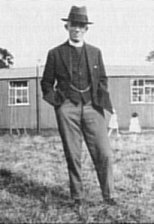 There had been only two superintendents in that time and the third, Alan Sykes, took over the post in January 1930, finally retiring at Easter 1968, making him the longest serving officer in the church. In 1931 the Rules were amended once again to make Church Meetings monthly but this was abandoned the following year due to very poor attendance (on one occasion 12 members from a church membership of 216). Even though he'd retired from his church offices, Alfred Ellis didn't stop working for the Church. In 1931 he was elected Vice President of the Baptist Union and in 1932, President. He died in 1936 and was remembered as the founder of the Church, President for 17 years, a man with the gifts of preacher, teacher, leader and friend. In his memory, a Memorial Fund was set up for a new church building on the Woodside Road site. In 1934 there was discussion about building an associated church in Little Chalfont where housing was rapidly being built around Chalfont Road station. Visits to the new houses and house groups were started. A Sunday School and evening service were held for a while and there was a proposal to seek a co-pastor. However in mid-1939 the idea was abandoned. In 1937, Tom Collins was appointed Church Treasurer and became another of the longest serving office holders. When he took the position, the church regularly had an annual deficit. However, within a very short time and with the help of the Financial Secretary, HJW Renshaw who looked after the envelope scheme, a surplus in the accounts was reported. The same year the first women deacons were elected. In September 1937, Adam Waugh retired and in October 1938 the Rev Murray Page of Finchley was invited to succeed him. In February 1939 he commenced his ministry, one month after the sad death of Rev Waugh.